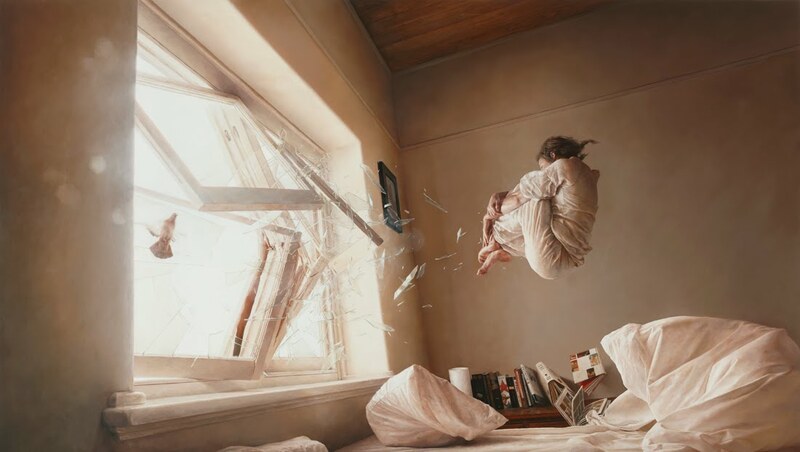 The Australian Jeremy Geddes takes one step further beyond the hyper realism in fashion to show us the visual equivalent of the “magical realism” of literature. In his works, we will see characters in different positions in the middle of bizarre contexts. The clearest example of this is his series of astronauts with old building backgrounds and doves. All of his paintings have a soft illumination and are extremely detailed; so much that Geddes can work for months in a single canvas. A perfect vacuum represents a turn in the artist’s motifs. In the painting, we can see a girl snuggled up, who burst violently into a room through its windows, as she has been shot from outside. We notice that in the pieces of glass still in the air and in the girl who, right after she hits the windows, is floating in the middle of the room. Underneath her, we will see a messed up bed due to the force of the impact: the pillows and the sheets fly chaotically, just like the books in the shelf at the background of the composition. A perfect vacuum is the real name of one of these books, which Geddes included in the painting. ~ by Álvaro Mazzino on May 27, 2011. Apple never gets into the detail of the “battery capacity” during launch. However, the tech giant gives out the “approximate battery life” derived from the new device. On top of that, Versace and crew managed to design one hell of a sneaker, which is always a good thing to do if you’re an older fashion house trying to win over younger sneakerheads. This entry was posted on May 27, 2011 at 15:54 and is filed under Realism.You can follow any responses to this entry through the RSS 2.0 feed.You can leave a response, or trackback from your own site.